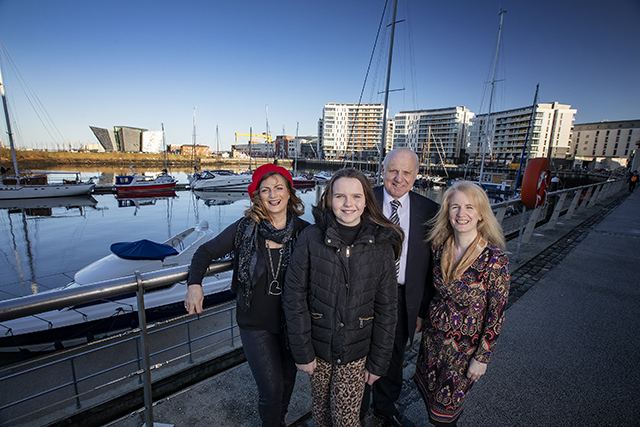 Image: Pictured are young writer Aisling Smyth,10, from St Theresa’s Primary School in Lurgan, composer Bridgett O'Neill, who composed a special piece for the festival, Brian Cassells, OBE, Chair of Lagan Navigational Trust and poet Olive Broderick. The stories of the Lagan Navigation were brought to life on Saturday (2nd February) at a special awards ceremony celebrating the creative talent of the communities that connect with the waterway. Organised by the Lagan Navigation Trust, and supported by the Arts Council of Northern Ireland National Lottery funds, Lisburn and Castlereagh Council, Belfast City Council, Armagh City Banbridge and Craigavon Borough Council, Waterstones, Libraries NI, the Odyssey Trust and many others, the Waterways Storymaking Festival invited local people to submit their stories of life on the Lagan using words, images, music and dance. With a theme this year of “Linen on the Lagan”, creative writing, tapestry and photography workshops ran through the Autumn, encouraging local residents to reflect on their own experiences of the historic waterway. As part of Saturday’s celebration event, prizes were awarded for creative writing across a range of categories for adults and young people. Residents in six local communities also learnt stitching skills to create a series of stunning tapestries which were displayed alongside a photographic exhibition, while local composer Bridget O’Neill worked with musician Colin Reid to create a new musical commission entitled Flight of the Locks. The Lagan Navigation dates back to the 1700s; connecting with 300,000 residents, 141 schools with a 35,000 pupil population, and traverses three council districts along its 27 mile route. As custodians of the waterway, the Lagan Navigation Trust campaigns and raises investment to have the route restored and fully reopened for communities and future generation to enjoy.